It’s the finale of the nineteenth season of Man Of The Hour! Listen in as the guys bid farewell to the teenage years of the show. 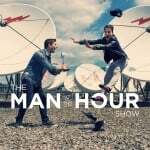 March 2nd is a date for the ages, and Patrick tells why on the latest episode of Man Of The Hour. Later in the show, Patrick celebrates winning his Oscar pool, and the guys discuss TV shows that make no sense. On this episode of Man Of The Hour, the guys debate buying an applause sign for “that’s what she said” jokes, look for investors for a dentist spa, and explain why a relationship with Taylor Swift will never be even sided.